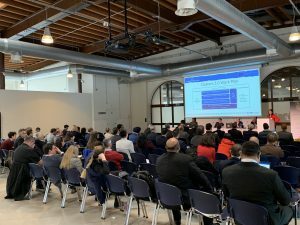 Clusters 2.0 was presented on 4th April at the DocksTheFuture mid-term conference in Trieste, Italy. The conference was embedded within the Horizon 2020 programme and was aiming at presenting the latest developments in the designing of the Port of the Future. 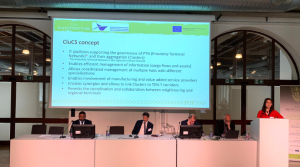 Consorzio IB Innovation, one of the consortium members, explained how the innovative solutions of Clusters 2.0 can contribute towards this goal. Clusters 2.0 is a Horizon2020 funded project that will advance more sustainable transport and logistics through transport planning and optimizations of European logistic clusters. As part of the project planned solutions, Consorzio IB Innovation and DBA Lab are developing an IT platform called “Cluster Community System” (CluCS). It enables an efficient and integrated management of resources and synchronizes operations in the clusters network of hubs, terminals and warehouses. Even more, CluCS could represent a cutting-edge tool for designing the Port of the Future. Not only can it manage information and operations among different logistic nodes, but also within ports themselves. Thus, it creates synergies among Clusters and TEN-T corridors, all while minimising the impact on environment and local communities. Interested in the event? You can find out more here.